Chile will face Mexico in their second group game of Copa America 2015 later today. The Mexican failed to win their first game against Bolivia and will be eager to get the three points from this game. While Chile are already on top with three points. The only player for Chile to concern with is Matías Fernández who is suspended for this game as he received a red card in the first game against Ecuador. Jorge Valdívia is likely to start in place of him. 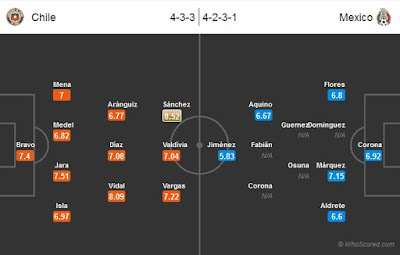 Star players Alexis Sanchez and Artuo Vidal will surely be going to play an important part in this game. Eduardo Vargas is expected to return to the lineup. Mexico are likely to start with four man defence after their failure with the back three in the last game against Bolivia. Javier Aquino who shined from the bench in last game could start today. In the past six meeting between them, both have won twice, lost twice and drawn twice. This will be the sixth meeting between them in the Copa America tournament. Mexico have kept five clean sheets in their last six games against Chile in all competitions (including friendlies). Chile won by two goals to one in last Copa America which was in 2011. Chile 1 – 1 Mexico, Alexis Sanchez on the scoresheet.